1. Junior Executive - Graduation from a recognized University/Institute. 2. Senior Executive - Graduation from a recognized University/Institute. 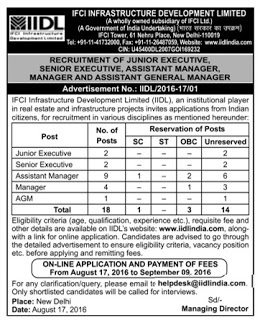 Candidates fulfilling the above eligibility criteria may apply through on-line application process at IIDL website: www.iidlindia.com. However, after submission of on-line application, the candidates are required to take print out of on-line application submitted, sign the same and send the same through Speed Post/Courier along with DD and all requisite documents/copies of certificates, duly self-attested within 10 days from the closing date for on-line submission.